I was bored, so I drew a KickMan uni-cyclist for the VCS. Since I had that sprite, I decided to draw a balloon. Since I had a cyclist and a balloon, I decided to animate them. I then added the moving balloons and ability to kick. Since I had the animation, I decided to add a simple tune. Since I had all of that, I decided to add a background. Here is a very, simple version of a balloon-popping uni-cyclist. Enjoy. I am not sure if I want to keep working on this or not. It could be a fun game, but the rules are pretty advanced for the VCS. I KNOW this is missing a lot from the KickMan rule set. I imagine it could be difficult to add missing elements. Pick balloons from bottom row. multi-color balloons with different speeds. need to "pop" balloons when stacked too high. 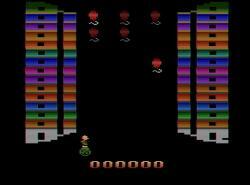 ability to kick character, such as Pac-Man, back into the balloon stacks. Since there are only 6 balloons, the rules would probably have to be so many sets of 6 per level. ...And NO; I can't "fix" the flicker. It's a VCS. Edited by darryl1970, Fri Aug 19, 2016 10:43 AM. Thanks. Can't wait to try this out. Great start on what you have the movement and "physics" of the balloon bouncing feels really good! I'd love to see this progress to a full game. I'm sure a lot of people would appreciate the classic arcade action even if it was a derivative style game and not a 1:1 Kickman Port. 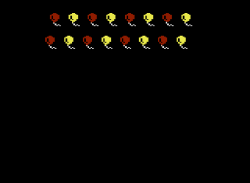 I dunno if bBasic can do like inline assembly or whatever, but I coded a Kernel that can handle flickerless balloons. It'd be great if we could combine them. 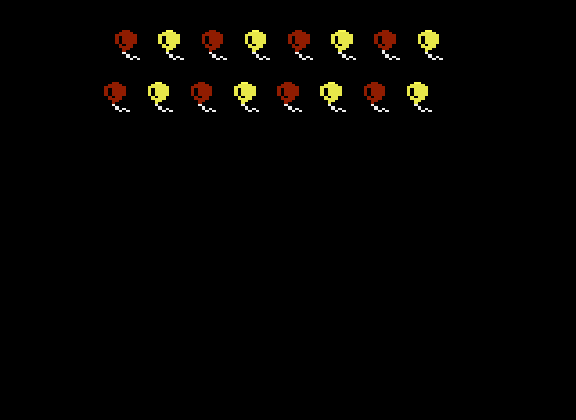 Update: I thought the balloons moved in kickman, so I added a bit of movement to the test kernel. Update Again: I need to stop and work on some other stuff. xD But I updated it to be 8 balloons like the arcade and multi-colours. Edited by Jinroh, Fri Aug 19, 2016 7:22 PM. Sweet! I'd gladly help out. I have a soft spot for Kickman. I didn't play it a lot, but I played one game that got me into a little trouble. I was late getting home, because I couldn't seem to lose. The game stated acting weird, and then it actually reset. in looking back, I assume that was the "kill screen". I didn't actually work out any physics in this version, but I do remember some key points. That looks nice! It'd be great if this did get fleshed out as a full game.